It’s been awhile since the previous update! Meanwhile Hosaywood is have been busy finishing up the new 30min documentary Kwa Giu (See Ball). Take note it’s spelled Giu (ball) and not Gui (ghost)! Also, watch out for the newly revamped Hosaywood.com and the online premiere of Zo Gang soon! 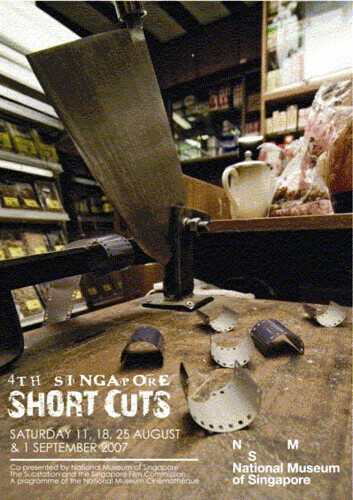 Over 250 members attended the 4th Singapore Short Cuts last weekend. Tickets ran out 3 hours after they were released. Thanks for supporting local film! Kudos to Sun Koh, Eva Tang/Tay Bee Pin, Ryan Tan, and National Museum (Wenjie, Li Koon). Keep supporting the next 3 screenings! “…Jacen Tan’s Zo Gang (Go work), starring an Ah-Beng looking protagonist who turns out to be more than he appears to be (putting an unexpected twist to the end), is just as entertaining. His constant whining, weird interpretation and frustration of local film and music, together with a slurring voice and droopy eyes, completes the short film in conveying the director’s statement of “speaking out on issues that were running through [his] mind”. Jacen has also designed the album sleeve for the new EP from Documentary In Amber.